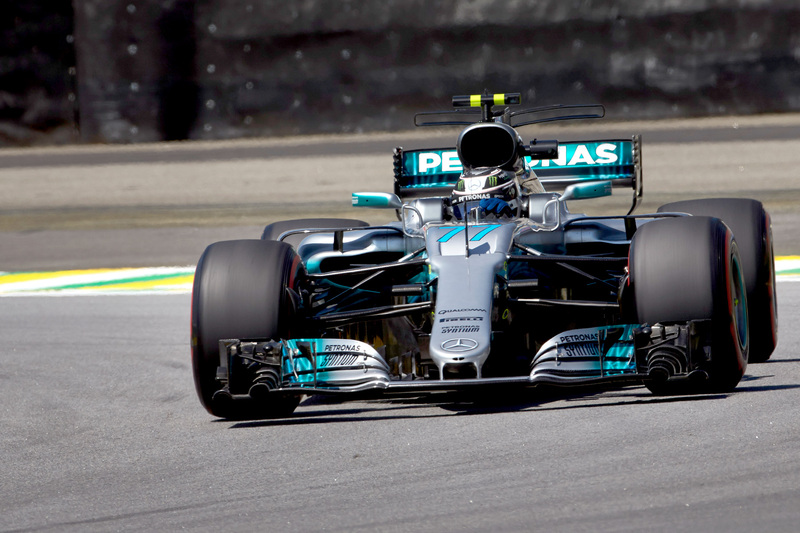 Valtteri Bottas has got his mojo back and has seized pole position for the 2017 Brazilian Grand Prix with a new lap record after teammate Lewis Hamilton crashed out. The fight for pole boiled down to a duel between the Finn and Ferrari’s Sebastian Vettel after 2017 champion-elect Hamilton crashed out in Q1, and the German seized the initiative at the start of the top-10 shootout to take provisional pole. But Vettel failed to improve his final flying lap, opening the door to Bottas, who didn’t require a second invitation to deliver the goods, beating the red car to P1 by 0.038 seconds. The lap — a 1 minute 8.322 seconds — was a new record for the circuit. The pole — his first since Austria in June — was important for Bottas, who has struggled for form since the midseason break. The Finn also knows the importance of pole at a classic circuit like Interlagos, where overtaking is difficult, but admitted Ferrari remained a threat. “It’s really good to start from pole here. We have a good car, [but] it’s going to be a close race with Ferrari. Vettel was disappointed to lose his provision pole position, especially now that the championship fight is over. “It’s all right,” he said in a downcast mood, explaining that “it’s not so much about tomorrow, it’s about today. The German was confident that he will have the pace to challenge in the race on Sunday, however. Kimi Räikkönen qualified a relatively distant third, 0.216 seconds behind Bottas. “It could have been better, but it was a bit tricky to sometimes get the tyres in the right window,” he said. Max Verstappen was 0.6 seconds off pole, Red Bull Racing not nearly as competitive as hoped before the weekend. The Dutchman beat teammate Daniel Ricciardo to P4 by 0.4 seconds, but the Australian is carrying a 10-place grid penalty that will drop him to P14 ahead of the race aftr other drivers serve their respective grid drops. Sergio Perez set the sixth-best time to head the midfield, and the Mexican was particularly pleased to have beaten Force India teammate Esteban Ocon, who was eliminated in Q2. Fernando Alonso’s qualifying performance was equally impressive, however, in putting his underpowered McLaren-Honda in P7 with an electrifying lap. Renault pair Nico Hülkenberg and Carlos Sainz were separated by a tenth of a second in eighth and ninth, and Felipe Massa qualified 10th for Williams. Esteban Ocon was the surprised elimination from Q2, the Frenchman missing out by 0.06 seconds at the hands of Renault’s Carlos Sainz. Ocon in P12 beat Haas’s Romain Grosjean, by a similarly tight margin, but the lower-placed Frenchman was almost 0.3 seconds quicker than McLaren’s Stoffel Vandoorne and teammate Kevin Magnussen. Toro Rosso’s Brendon Hartley didn’t set a time. The New Zealander carries a 10-place grid penalty that will like drop him to P18 ahead of his similarly penalised teammate Pierre Gasly and the crashed-out Lewis Hamilton. Qualifying started with a bang — specifically the sound of Lewis Hamilton’s Mercedes smacking against the barriers less than three minutes into the start of the session. The Briton carried too much speed into turns six and seven, and as the rear of his Mercedes W08 stepped out he lost control and quickly ended his afternoon against the wall. Ferrari’s Kimi Räikkönen took the reins to qualify fastest of the session, both he and third-place Sebastian Vettel using the soft tyre as opposed to the supersoft. Valtteri Bottas in the remaining Ferrari split the pair. Felipe Massa was a standout, setting the fourth-fastest time in his final Brazilian Grand Prix weekend. In the knockout zone newly crowned WEC champion Brendon Hartley edged himself into Q2 with a final flying lap, besting Toro Rosso teammate Pierre Gasly. Both carry 10-place power unit penalties, dropping Gasly to P19 ahead only of Lewis Hamilton, who will have to ask for permission to join the grid after failing to set a time. Pascal Wehrlein separated the Toro Rosso cars after his Sauber team changed a host of aerodynamic and suspension parts in an effort to address his mysterious lack of pace compared to his teammate, Marcus Ericsson, in recent races. Ericsson qualified last in P19, behind Williams’s Lance Stroll.